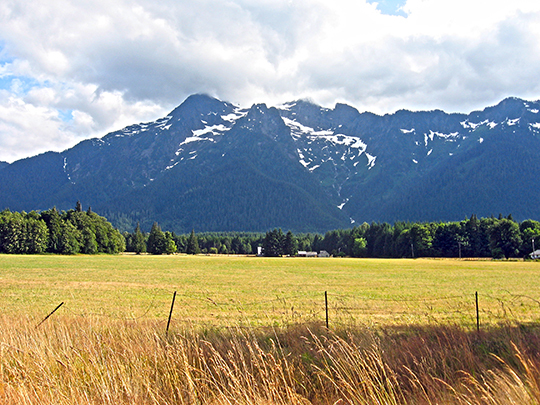 Photo: Skagit County farmland at the base of the Cascade Mountains, north of Darrington, Washington. Photographed by user:User:Drums600 (own work), 2008, [cc-by-3.0 (creativecommons.org/licenses/by/3.0)], via Wikimedia Commons, accessed May, 2013. Skagit County administrative offices are located at 1800 Continental Place, Mount Vernon, WA 98273; phone: 360-336-9300. The Skagit Valley was inhabited for thousands of years before the arrival of settlers in the 19th Century. The cession of tribal lands through the Point Elliot Treaty of January 22, 1855 greatly changed traditional Native Americans' ways and beliefs. Land titles and surveys were alien ideas to the customs of Native Americans, but were basic to the farmers settling in the valley. Skagit County was established in 1883 and named after the river and one of the Indian tribes that lived along its banks. The Skagit River is the third largest in the western United States, flowing 78 miles through a diverse and beautiful land. The county stretches from the crest of the rugged North Cascade Mountains on the east, down through the fertile valleys, to saltwater beaches. The topography of Skagit County ranges from sea level to 8,966-foot Mount Logan and is reflected in the terms used for such places as the Skagit Flats, western islands, upper Skagit, Sauk, and Samish River Valleys, and the Cascades. A fern-covered prairie on March's Point seems to have been the site of the first white settlement. By 1870, other new settlements were located elsewhere in the Flats, although there was still very little development. Construction of dikes enabled the growth of farming on the rich delta land. By 1890 railroads were instrumental in supporting the farming, logging, and mining industries, featuring a line from Portland, Oregon to Anacortes. During the 1890s, two north-south lines were completed through the county, connecting it with Seattle and Vancouver. By 1901, the east-west line was extended from Hamilton through Concrete and into Rockport. The Skagit River has played an important role in the history of Skagit County. Tribal settlements were located near salt water and along the rivers. For new settlers in the logging business, the Skagit provided the means to transport timber, although logjams hindered activity until 1889. By 1890, most of the land next to water had been logged off, and operations moved further inland using animals and machines to transport timber. The River and Sound also furnished an abundance of resources. Salmon provided an important food source for the early tribal peoples. Commercial fishing by new settlers began in the 1890s with the building of fish-processing plants and by 1900, clams and oysters were also being canned. By the turn of the century, however, over-fishing had reduced available stocks and experiments with fish hatcheries sought to supplement dwindling fish runs. Over the next thirty years, canneries continued to be productive in Anacortes. When the commercial fishing industry declined, other marine industries emerged, such as boat-building and recreational boating. Today, the Anacortes and La Conner marinas are among the largest in the State of Washington. When Skagit County separated from Whatcom in 1883, the following year La Conner was established as the temporary county seat with its established port and considerable population. The county's first newspaper, the Skagit News, garnered sufficient support to make Mount Vernon as the county seat and a vote later in 1884 confirmed the change. Board of County Commissioners, Skagit County Planning Commission, Growth Management Update & Public Outreach Steering Committee, and Planning & Development Services, Skagit County Comprehensive Plan, October, 2007, www.skagitcounty.net, accessed May, 2013.